For the first time in the world, a football match in the Johan Cruijff ArenA was broadcast in real time, with only 0.3 seconds delay, in Daejeon, South Korea. 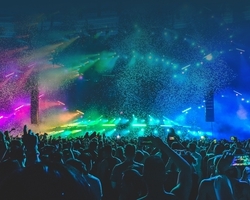 Combining new Ultra-Wide Vision technology with a super-fast data connection enabled a group of South Koreans to experience the live event in an unmatched way. 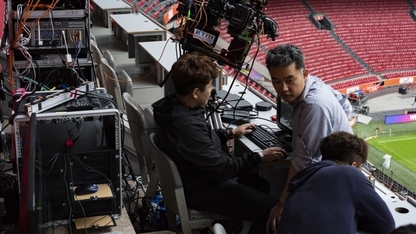 Conducted by TNO, the Johan Cruijff ArenA, the Korean Electronics and Telecommunications Research Institute (ETRI) and SURFnet, the test broadcast was designed amongst other things to demonstrate whether European Championship 2020 matches can be experienced live worldwide. With the aid of Ultra-Wide Vision technology, the match and the stadium was viewed in panorama at very high resolution. The extremely wide screen, comparable to three television sets beside each other, made literally every blade of grass visible. 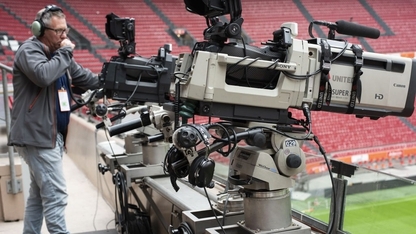 During the match, three special cameras stood side by side to ensure the super high quality panoramic image of the entire field. This technology gives viewers the feeling that they are in the stadium, even on the other side of the world. This test is part of the European ITEA 3 research. The Ultra-Wide Vision technology was developed by the Media Orchestration from Sensor to Screen (MOS2S) project, on which 16 organizations from the Netherlands, Belgium, Turkey and South Korea are working together.